Hi. You’re probably wondering why there hasn’t been a post for over two weeks. No, we’re not dead. No, we haven’t stopped brewing. But things have totally slowed down. It’s the heat. Summer in Melbourne has been a real stinker the last 8 weeks or so. Plenty of days above 32°C. Chas had a little trouble controlling temperature with the second Red Dog Pale Ale. Beer turned out good, review up soon. 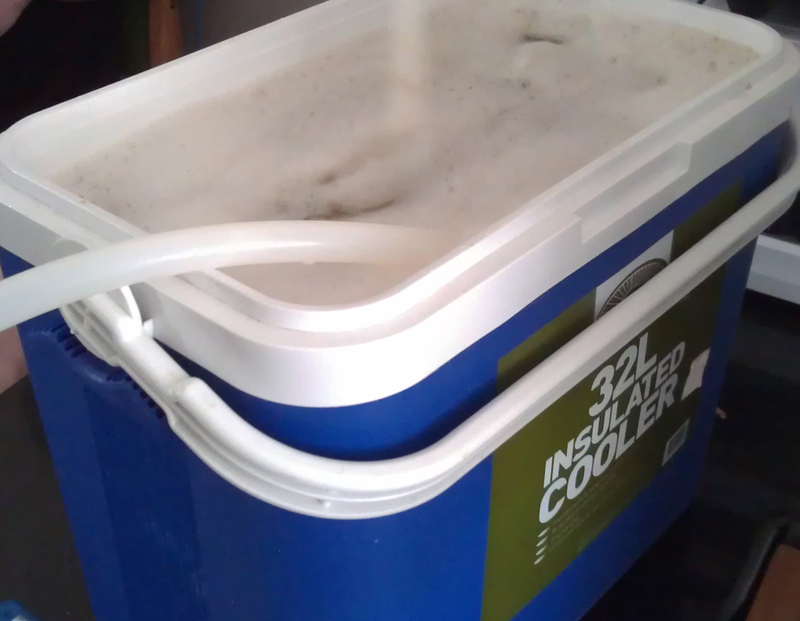 Chas keeps everything inside and that means when he cools his place the beer stays cool. At my pace I’ve got the brew shed, AKA the garage. No air-con, no fan, not even an ice pack. No cooling means no brewing. I’m not going to leave another brew ferment at high temperatures, or worse kill the yeast. I’ve been thinking about some work around solutions. Might try something if it’s going to look like we’ll have a whole week under 25°C. Good news is we’re going to have four days in a row under 25°C. Bad news is it might be another month before we’re consistently under that. I’m also looking at a long term solution. I need to get my act into gear and get rid of some stuff first. As I’m not brewing I’ve gone to visit some others who are. Three weeks ago, on Australia Day, I went and visited my friend Michael. He’s a super keen brewer and looking to make it pro. He has gone all grain brewing and has plenty of equipment. You can read about his brewing journey on his blog twistnstout. The day I visited he was brewing his Triple. Was great introduction to what all grain brewing is like. I wasn’t able to stay the whole day but did get to check out a lot of the gear. Man, he has heaps of cool stuff. Things like counter-flow chillier, pump for his mash tun and a brew fridge for fermenting & conditioning beer! We haven’t talked about all grain brewing much, so a few of those things probably look like made up words. Might update some of the sections here so we can talk about that stuff more. Anyway, good day. Michael’s electric pump to do the recirculation. Next to the mash tun. Just over a week ago I went and visited Justin, Carnie Brew, and his mates for a brew day. They had four sets of equipment and were doing four brew-in-a-bag all grain brews when I got there! Then they did a fifth! Four big, and I mean really big, pot/kettles/urns all heating the grain made for a very hot room. It was a long day as they started at 9am and the last brew wasn’t done until about 5pm. Very interesting that they all did no-chill. It’s where you put the hot wort in a vessel, squeeze out the air and leave to chill over a few days before starting fermentation. Was a lot of fun hanging out. Was a bit of a contrast to the all grain brewing at Michael’s place only two weeks before. And, good comparison to the brew-in-a-bag all grain brews with Chas. 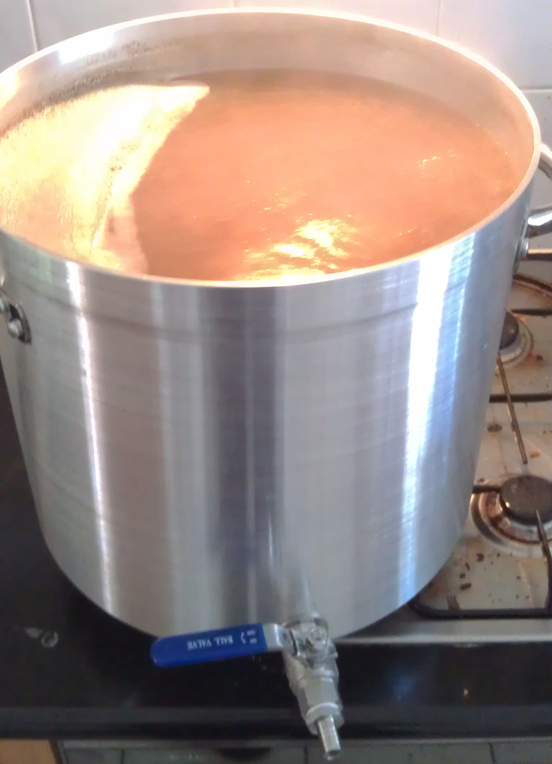 Big pot for boiling the wort. Note that there’s a tap for easy draining. When will I brew again? Hopefully soon. Have a few things I’m keen to try. Some more pale ale trials, a super stout and my first all grain brew are on the cards. Until then there’s a few write ups to be done, including one that’s well overdue.